A simple registry of all parameters associated with a Component. This registry allows one to loop over or search for given parameters in a Component. Definition at line 33 of file ParameterRegistry.H. Definition at line 25 of file ParameterRegistry.C. The Parameter class uses this method to register itself on construction with its owning Component. Definition at line 29 of file ParameterRegistry.C. References LDEBUG, LFATAL, and jevois::ParameterBase::name(). For all parameters that have a callback which has never been called, call it with the default param value. Definition at line 59 of file ParameterRegistry.C. The Parameter class uses this method to un-register itself on destruction with its owning Component. Definition at line 42 of file ParameterRegistry.C. 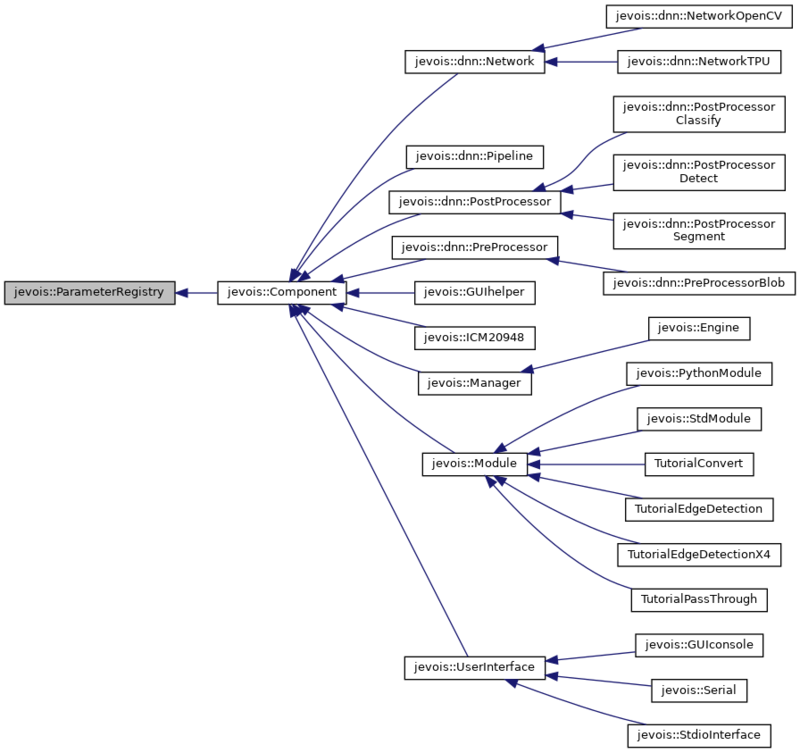 References LDEBUG, LERROR, and jevois::ParameterBase::name(). Allow Component to access our registry data, everyone else is locked out. Definition at line 51 of file ParameterRegistry.H.